December 7, 2012, Los Angeles – Cleopatra Records is sad to pass on the news that Hawkwind guitarist Huw Lloyd-Langton has passed at the too-young age of 61. Huw had been bravely battling cancer for the past several years and died peacefully at home in England with his devoted wife Marion by his side. 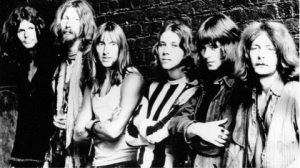 A self-taught guitarist with mind-bending scope and range, Llloyd-Langton joined Hawkwind in 1970 and immediately made his mark by contributing his unique guitar stylings on the band’s groundbreaking self-titled debut album. The album is considered historic in that it was one of the first space-rock albums to be released. Shortly thereafter, Huw left the band to embark on his own musical journey but he continued to be an integral part of the Hawkwind sound as both the occasional band member and frequent collaborator with his Hawkwind mates on numerous occasions as the years unfolded. He was on-board for the albums Live Seventy Nine, Levitation, Sonic Attack, Church Of Hawkwind, Choose Your Masques, The Chronicle of the Black Sword, The Xenon Codex and this year’s Onward. Huw also toured with Leo Sayer in the 1970s and was a founding member of the acclaimed U.K. hard rock band Widowmaker, which released two well-received albums in 1976 and ’77. He was adept at playing all styles of music – from hard rock to classical to blues – performing in the various genres with seamless ease and jaw-dropping talent. His innovative guitar work was featured on the Space Rock Invasion DVD taken from the 2011 Space Rock Invasion tour on which Huw participated, as he opened to critical applause for Nektar and Brainticket. Cleopatra is preparing to release Huw’s Rare & Unreleased Anthology in January, which will now be an amazing posthumous tribute to his work including never-before-heard solo acoustic recordings of songs later recorded by Hawkwind along with tracks from Huw’s solo band. So long Huw, may your journey from space-rock originator into an explorer of the great unknown be as interesting for you as your time on Earth was for us.